Try a new fruit every month to experience different tastes and build your knowledge base. If there’s no market in your town that specializes in exotic produce, check online specialty retailers. 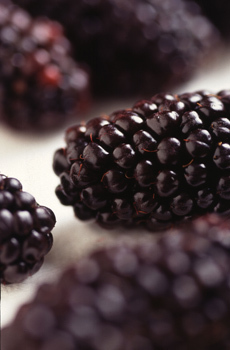 Photo of Black Butte blackberries by Bob Nichols, courtesy of the U.S. Agricultural Research Service. Across the country, there are family orchards dedicated to growing the finest apricots, cherries, plums, pecans. Their output is limited: They sell locally plus direct to consumers. Whether you’re looking for fresh fruit baskets or dried fruit arrangements, we’ve tasted some of the best. We’d love to hear about your favorites—use the Contact Us link on this page. See the Snacks Section for reviews of snack nuts and cocktail nuts. Fact: Fruits are not necessarily sweet. Tomatoes are fruit, avocados are fruit, hot chiles are fruits, cucumbers and squash are fruits. Because they aren’t sweet, people think of them (and classify them in recipes and produce departments) as vegetables. But by botanical definition, fruits have their seeds on the inside; the only exception is the strawberry. With fruits, the seeds, or pits, are contained in the fruit’s ovary sac. True vegetables have no “pit” or seed sac. Fruits don’t have to be exotic to seem like a special dessert. 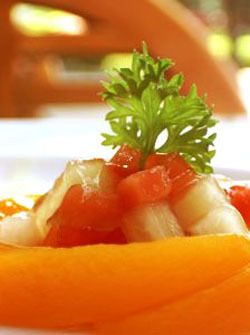 While a bowl of star fruit, mango and papaya may be a more unexpected treat, so is creating an architectural sculpture or a nest of everyday fruits like melon with a dice of papaya and pineapple.